LB-489 acts as data acquisition module, collecting measurement data from attached sensors. Measurement results are then made available for outside world via Ethernet port and diverse selection of communication protocols and data formats. Server room monitoring: temperature measurement in various places, humidity measurement, wet condition sensing (water flood), door/security sensor. Small weather station: measurement of air temperature and humidity, atmospheric pressure, wind direction and velocity, sun radiation. Local temperature measurement: 4 independent, simple and cheap thermistor probes. Multipoint temperature measurement: four 8-input LB-711 hubs allow for attaching 32 independent, precise 4-wire Pt sensors. Thermometer input allows for temperature measurement in the range of -60 .. +150 °C, by the means of external thermistor sensor. Dedicated sensor with specially selected thermistor assures optimal measurement accuracy of 0.1 °C in the range of -30 .. +100 °C, and 0.5 °C in the remaining range. Thermistor sensor is optimal and economical solution to temperature measurement in most of the cases. When there's requirement for more precision, wider temperature range, long distance from sensor to data acquisition module, or special Certificate of Type for legal purposes, then wide range od S300 sensors is available for such purposes. S300 input allows for connection of any sensor equipped with S300 interface. S300 is a digital current loop interface, utilising 2-wire sensor connection, allowing for significant distace from sensor to data acquisition module. S300 interface simultaneously supplies power to the sensor, and measurement data in digital form from sensor to the data module. LB-921 - universal A/D converter. Voltage input allows for 0..3V voltage measurement (or any other, for example 0..10V, using external resistor divider). Binary input allows for sensing of dry contact. it can be NC/NO contact, for example door security switch, or any other circuit that acts as switch. Sabotage detection allows for differentiating between open/close state of attached contact, and line sabotage that results in short/open condition. Ethernet interface allows for connecting LB-489 module to data transmission network. It's possible also to connect it directly to the PC. Ethernet interface works with 10 or 100 Mbit/s data rate. POE (Power Over Ethernet) is a production option for LB-489 data module. POE greatly simplifies installation. There's no need for separate power supply near the module, which is powered over Ethernet cable. LB-489 module supports standard communication protocols. It allows for simple intergration with any measurement and control systems, that utilize the following protocols. IPv6 support enables use in current and future networks operating this new generation IP protocol. Investment in LB-489 module is future-proof, allowing for no second thought about infrastructure upgrade when the IPv6 will be used in current IPv4 networks. IPv6 Stateless Address Configuration (SAC) is supported and allows for almost no setup when connecting the LB-489 data module to IPv6 network. LB-489 data module acts as a web server, providing simple WWW page with current data view in any WWW browser. Data is automatically refreshed, so the view stays current all the time. LB-489 data module serves all the measurement data in JSON data format, over the HTTP protocol. Typical usage covers the whole variety of web applications, that speak JSON. lb489-json.php is an example PHP script, showing how simple it is to retrieve measurement data from LB-489 module and embed it in the custom WWW page. 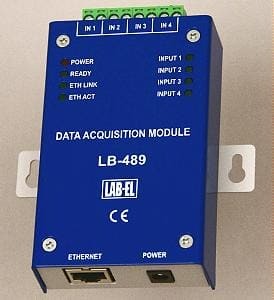 LB-489 data module serves all the measurement data also in XML data format, over the HTTP protocol. Typical usage is similar to JSON - web applications that speak XML. But that's not the end of possibilities. 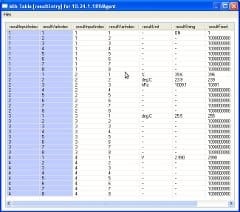 Any system that can retrieve chunk of data over HTTP protocol and parse JSON or XML can easily get the measurement data from LB-489 module. LB-489 data module supports SNMP protocol, typically for NMSs. 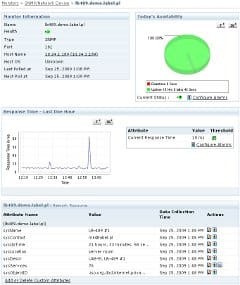 SNMP monitoring provides specific information about network interface state, and readout of all measurement data. Typical usage, as server room environmental conditions monitoring, allows for temperature and humidity sensing, water flood detection, door security watch, etc. 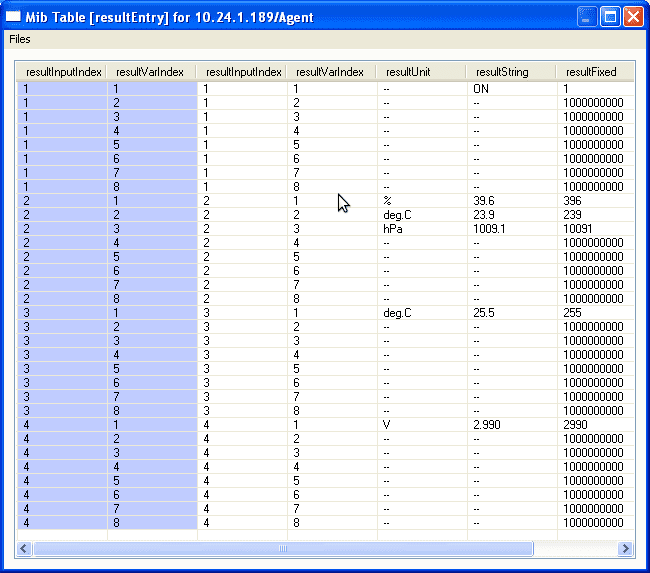 It's possible to set alarm thresholds for every measured parameter. 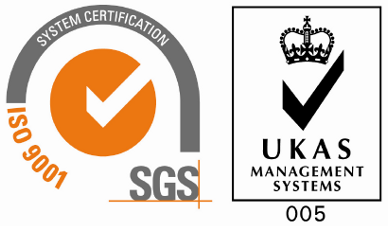 Detection of alarm conditions results in sending SNMP TRAPs to NMS system. NMS system later processes these TRAPs, alerting appropriate staff. LB-489 data module serves all the measurement data as MODBUS variables over TCP protocol, according to Modbus Organizations specs. 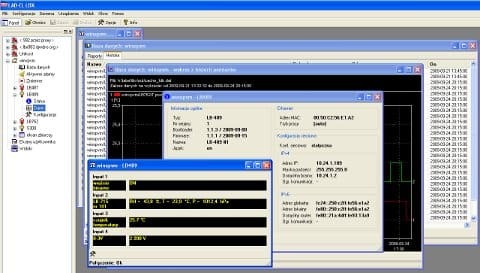 MODBUS/TCP allows for simple connection of LB-489 data module to SCADA systems. LB-489 data module keeps 32 independent alarm thresholds for measurement data. 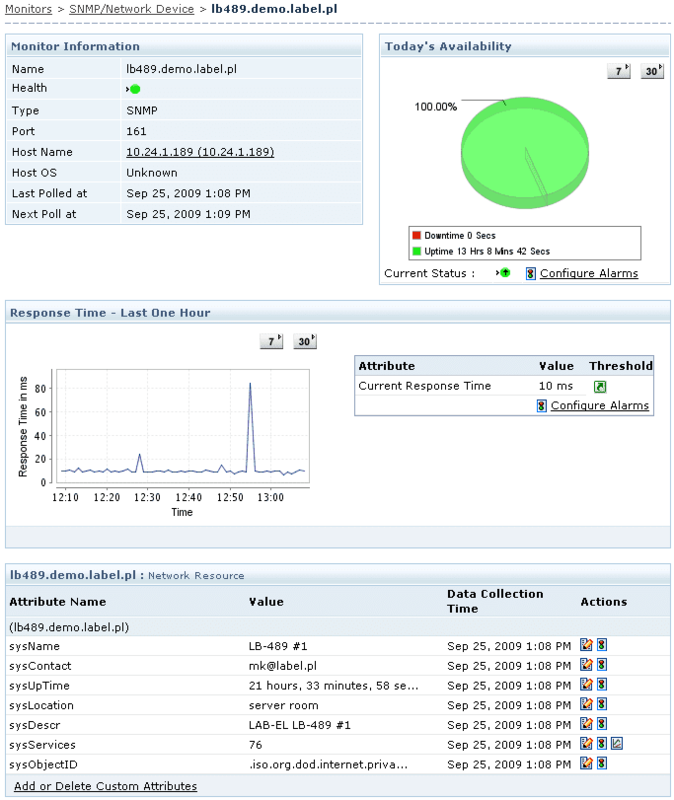 Alarm events are sent out as SNMP TRAPs and emails (SMTP). minimum duration (for filtering out transient conditions). Every alarm can be connected with any selected measurement result. It's possible to define 32 alarms for 32 independent results (one result, one alarm), or at the extreme opposite, 32 alarms for single result. 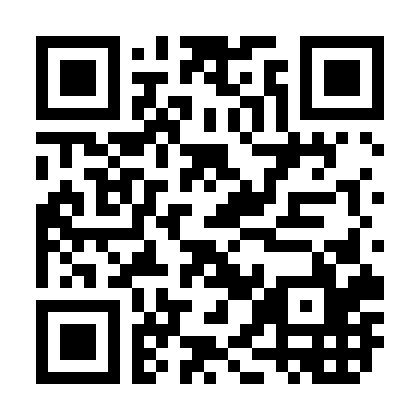 LAB-EL company offers dedicated software for LB-489 module - LBX application. client-server architecture, allowing for remote access. LB-489 data module is powered through external 12V connector by default. External power supply allows for connection to the mains line (230V 50Hz), or one can connect the module to the low voltage line, for example with battery backup in demanding installations. LB-489 can be equipped with internal POE module, as a production option. POE allows for powering the data module via Ethernet cable, without any other external power supply. Such option greatly simplifies installation, especially in places where there's no access to the mains line - either due to inconvenience (no easy access) or due to safety regulations. POE usage requires special network infrastructure - switches must have POE ports, or it's possible to insert the midspan power suppy into the cable near the switch.